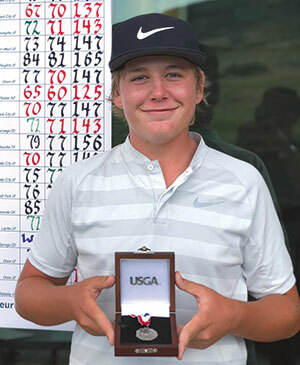 Scottsdale’s Preston Summerhays, 15 – fresh from becoming the youngest champion of the Utah State Amateur in tournament history a month ago – fired 65-60 on Utah’s Soldier Hollow Golf Course to qualify with ease for the U.S. Amateur to be contested August 13-19 at Pebble Beach and Spyglass Hills, to be televised on FS1 and Fox. One of the highlights of the qualifier came in the first round on the 6th hole, a 588-yard par 5 where he made an eagle-3. Add birdies on holes 7, 9, 10 and 11, and he went 6-under par for the six-hole stretch from 6 to 11. He also made birdies on 17 and 18. “My dad was my caddie and we just tried to make as many birdies as possible,” he said. In the second round, Summerhays made seven birdies on the front nine to shoot 7-under-par 29. And on the way in, he picked up three more birdies and an eagle-2 on the 404-yard, par-4 14th hole to post a 12-under-par 60 – a course record by two strokes. Moreover, if his approach into the green on the 36th hole released a few more inches, he would have posted a 59. Summerhays finished the tournament at 19-under par, eight strokes clear of second-place finisher, Drew Kittleson, also of Scottsdale.